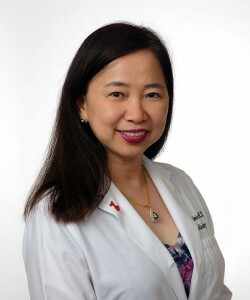 HTWE SEIN, M.D. (pronounced Tway Sane) is a board certified cardiologist, specializing in clinical cardiology. She has a particular interest and expertise in the evaluation and treatment of heart disease in women. Dr. Sein completed her Cardiovascular Fellowship program at Long Island Jewish Medical Center in New York, which is affiliated with the Albert Einstein College of Medicine. Htwe is also board certified in nuclear cardiology and directs our nuclear program. Dr. Sein is married and mother of two.